Financial institutions, especially banks, have proved to be a boon for the economic development of a country like India. An attempt has been made in the present chapter to analyze the state of financial inclusion and the role of banking in achieving full financial inclusion in India. 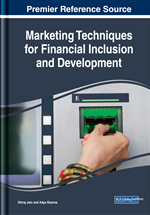 The journey of financial inclusion through banking in India has been critically appraised. Some of the important outcomes that can be highlighted are increased banking access of rural population in past few years together with the huge expansion in banking infrastructure in rural areas. Banking in India has been transformed with the introduction of PMJDY, BC Model, etc. Increasing trend has been observed in IMPS and M-Wallet penetration. North-eastern part of the country is still a challenge in the way of financial inclusion. The journey of financial inclusion on the wheels of Indian banking industry is still in search of the ultimate destination, and it will take miles to achieve full financial inclusion. Financial Inclusion in developing countries like India is very much essential for sustainable growth and the role of banking industry becomes vital since offering banking services to everyone is a necessary building block for sustainable growth. If everyone has the tolls and resources to better themselves, it would increase individual productivity, growth and economic prosperity. According to the World Bank, around 2 Billion people don’t use formal financial services and more than 50% of adults in the poorest households are unbanked.